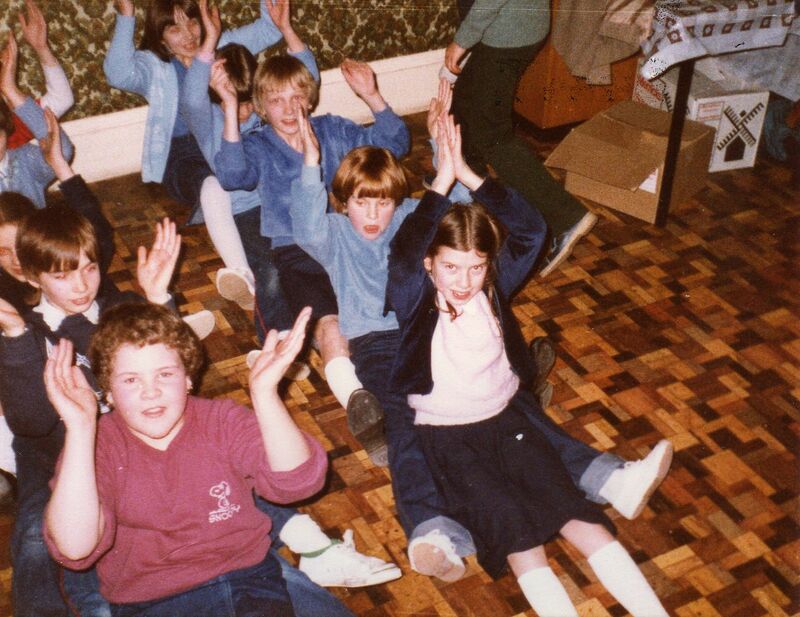 These 4 photos were taken during a joint school weekend away (in Clacton?) in the 1980s, I think. I believe the schools were Wickford County Junior, North Crescent and Hilltop Junior. We gathered a group from each school to practise music for an oratorio called “The Wooden Horse”, a complicated and challenging work to perform. 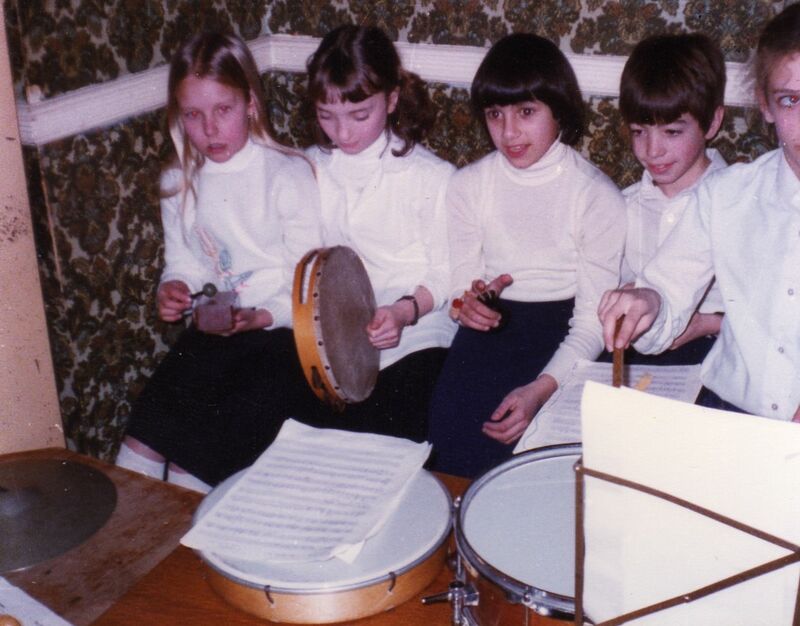 In photo 1 I think its Sarah Carter just on the edge of the picture holding the drumstick. In photo 3 the disco continues. Sarah Blundell, in red, leads a group with Susan Tucker behind and possibly Sarah Carter behind her. In the other group Debbie Hughes with blonde hair is looking straight to camera. I`m sure that all of these were from WCJS, but regret I need prompting about the other names. 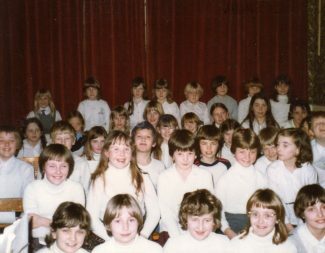 In photo 4 I guess this was a dress rehearsal (probably at WCJS as there`s a mixture of children I recognise and some I don`t. All the front row are from WCJS,centre is Claire Donaldson. Behind them I think are all WCJS too. Third row from front has the two Anstead boys either end. Fourth row from front, right hand end, Tracey Williams is sitting. It was only much later in my teaching career that I realised how lucky I was to be doing things like this with junior age children, to have the enthusiasm of the children, the support of parents and of the staff too. I do hope that they will identify themselves and are able to post up their memories of their time in the juniors! Remember me? My bro Phil is a a double bass player. 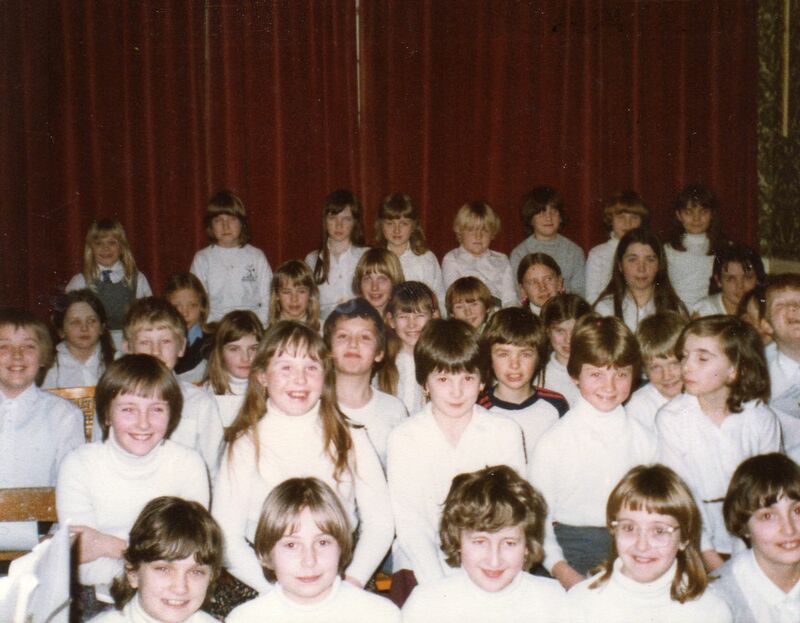 I was at Wickford Junior School 1978-82. At least one other student is also a music teacher, I don’t know her married name but I believe Anna Hutchings is a music teacher as well. 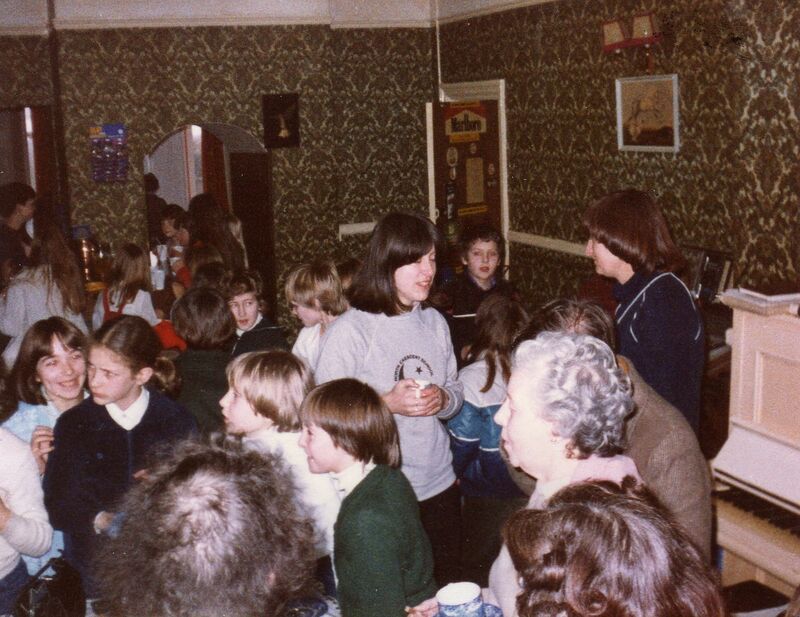 In photo 1, on the left I’m pretty sure that’s Elspeth Watson. She’s one of my best friends so I hope I’ve got that right!!! I don’t recognise who she’s sitting next to but then it’s Nicole Harrington then Andrew Woods. Hope I’ve got that correct. They went to North Crescent as I did. I loved that school. I only wish I still had my North Crescent sweatshirt like the one that lady’s wearing in the other photo. I doubt mine would fit me now!! Yes, I remember Mr Mason, he taught me in class 3A in 1953 and congratulated me with ‘Bless you child’ when I recognised the red dot on the map as being Colchester (we were studying the Romans). I also remember Miss Brewster, who not only taught me but also my Mum, born 1907. Miss B was the needlework teacher, the first teacher I met when I joined WCJS in 1951 for the last few weeks of the summer term. Mr Hancock taught me in class 2A and Mr Londesborough in class 4A. Mr Cole was the Headmaster then and his son Jeremy was in my class all through my time there. Jeremy was given no favours – in fact he bore the brunt of his Dad’s constant tirade as he flew into the classroom with on the spot questions. We got to know that even if we didn’t know the answer, it was better to shoot our hands up, for Mr Cole ignored those apparently dying to give him the answer but demanded only from those slow to raise their hands. He was also an excellent choir master and along with Miss Mobbs, who taught the recorder, he produced summer and winter concerts of extraordinary quality which I always took part in. At the end of every concert, we received an iced bun! (see WCJS for pictures). Does anyone remember Mr Kitson, Mr James, Mr Timpson, Mr Burk, Mr Ross, Mr Mason, Miss Brewer, Miss Askins, Miss Northwood of Wickford School, Market Road, Wickford. yes Cyril, I remember those teachers but don’t remember those classrooms. I do remember the prefab classrooms rear of the red brick school which is now a youth centre I believe. Also Miss Sortwell was head mistress of junior school. Also Miss Brewster who lived the bottom of irvon Hill opposite Carters, many a caning from her. When I first went to school in the year of 1942 the infants’ school was two class rooms in the big school, not by the red school. The school Bob Croot spoke of was not built then, at a guess I would say 1943, run by two teachers, Miss Keeling from The Laurels, Swan Lane, and Miss Holloway from Nevendon Road. She emigrated to Australia in the 1950s. In my early years the now junior school was the secondary school. 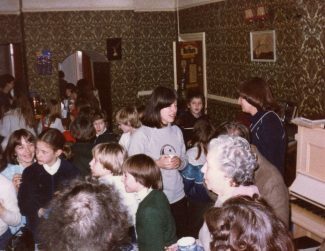 We had great youth centre in the evenings, teachers would stay behind to run the centre. We could do judo, p.t., dancing, maths, english or just chat the girls up. The teachers were strict day and evenings, no hooliganism much in those days. When I went to infants school in 1942 it was in the rear of juniors school playground, then to juniors, then across the road to seniors school, where we spent time in air raid shelters having lessons or eating our sandwiches at lunchtime. Children came from outlying villages around and about eight doubledecker buses full.